Nestled between the Orange River and towering oak preserves, Hammock Creek features 24 of the most exclusive home sites in Verandah, located in East Lee County. 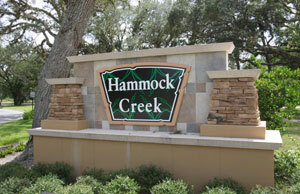 Single family homes in Hammock Creek range in size from 2,800 to 5,000 square feet. Floor plans and exterior elevations reference historical styles that capture Old Florida living with front and rear verandas, shake-style roofs, dormers, lap siding, and decorative columns. Finally, Dan you were also a pleasure to deal with, you are a good honest man. Your team builds a beautiful home that Amanda and I are very proud to own. As we have discussed, I look forward to building another home with you in the future and will be sure to tell others what a quality product and organization that you have. Thanks again.